The Outernet Dreamcatcher has recently gone on sale and is now only $39 USD. Previously it was priced at $79 and $59 USD. 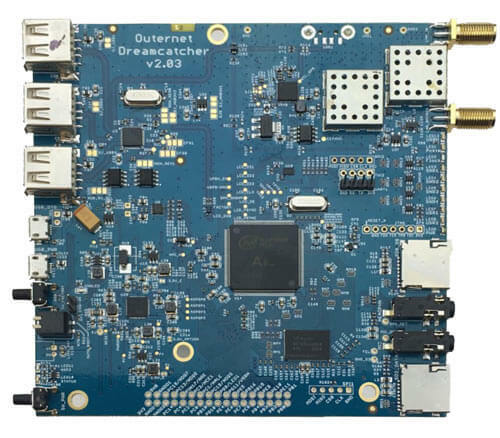 The Dreamcatcher is an RTL-SDR and computing board all built onto the same PCB. It has two SMA inputs - one is an L-band filtered and amplified input and the other is a standard wideband port good for all frequencies covered by a standard R820T2 RTL-SDR. For $39 it appears that you get the board itself, and a WiFi dongle, but no antennas, cables or SD cards are supplied with the unit. In you are interested in the Dreamcatcher then back in June we posted a comprehensive review of it as well as their ceramic L-band patch antenna. Since then we've found that the Dreamcatcher has become much more stable and is very useful for applications like setting up a dedicated ADS-B receiver/feeder. At this price the Dreamcatcher is even better value than using a Raspberry Pi 3 plus external RTL-SDR dongle which can end up costing over $60 USD. According to Outernet stocks appear to be fairly limited so this price probably won't last for too long. Note: We'd advise not purchasing this for use with the Outernet data signal as we're unsure if that signal is going to last for much longer. Purchase it as a general purpose radio/computer instead. Which is still cheaper than the lowest price it was available for before, without shipping.